I have recently had complaints about the extent of rubbish and litter along the western end of the path running from Roseangle to Greenmarket. The problem area has been the part from Seabraes west towards the Roseangle car park. The council’s Rapid Response Team, at my request, kindly did a litter-pick there recently. However, I wrote to Scottish Enterprise to get its assurances that it would ensure the area is kept clean in future, as I was sure responsibility would rest with Scottish Enterprise. 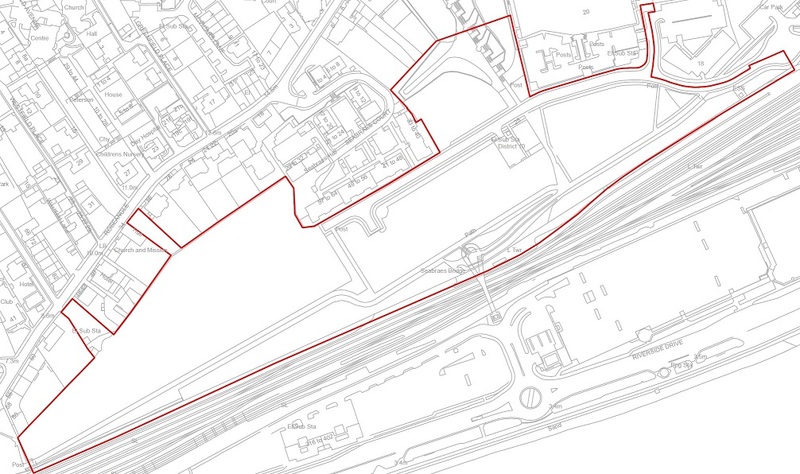 “I am advised that SE’s responsibilities cover the area shown outlined red on the plan (below). Last week, following complaints to me from residents that the lift at the Seabraes lift was again out of action, I reported this to the City Council. 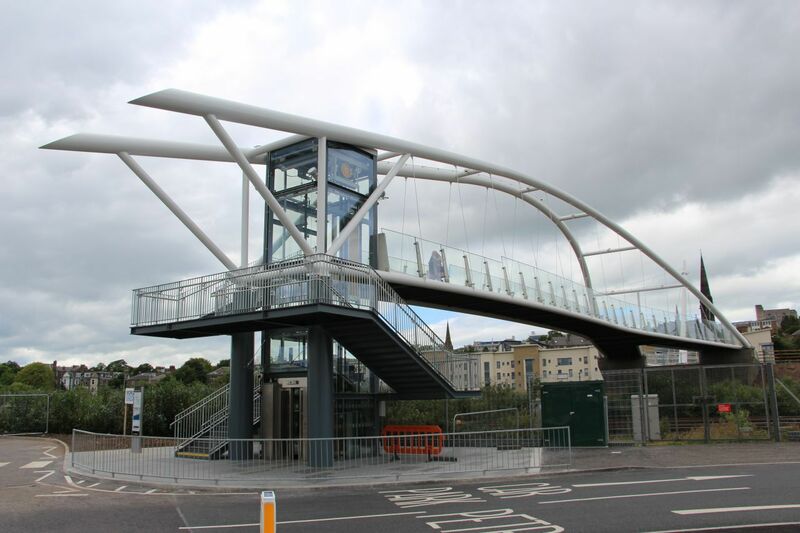 The lift was swiftly repaired but I have asked for – and been given assurances – that signage will be provided with the contact phone number for reporting when the bridge is not working. 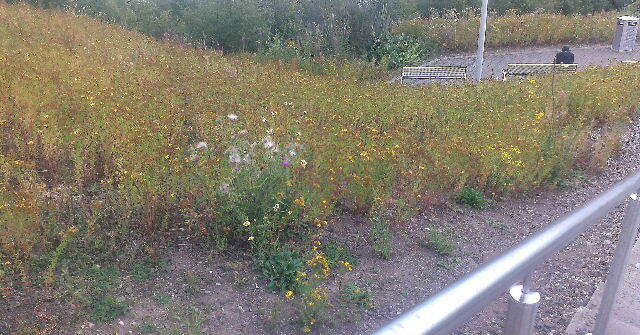 I have highlighted over numerous past years the superb job the City Council made of Seabraes planting each year. I have queried with the City Engineer when the new bridge at Seabraes will be open to the public. It is a little behind schedule (originally planned for a ‘soft opening’ in late May with an official opening in June). “Just to confirm that the Official Opening will not take place on 16 June 2015 as the Transport Minister cannot make that date. Instead the Official Opening will be arranged for August/September after the schools have returned from the summer holidays. The important thing is to get this new bridge opened so I am pleased there is now certainty about this. It looks really good and will give a great new link between Riverside and the Seabraes/Perth Road areas. Yesterday afternoon, along with two representatives of the Bonnie Dundee group and a representative from the City Council’s Environment Department, I took part in a site visit to the stepped area at Seabraes to discuss improving the area. The “top” part of Seabraes is beautifully maintained by the Environment Department. 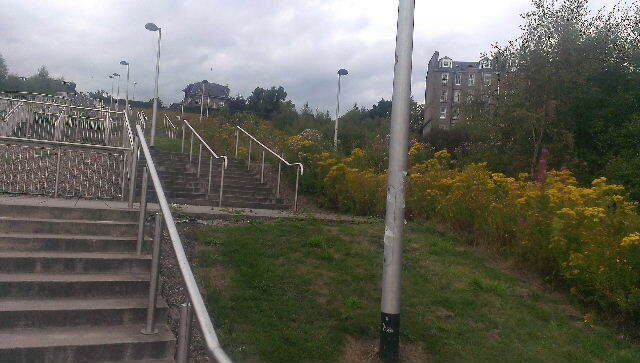 However, the stepped area below is very overgrown and unsightly, despite the steps themselves being well-designed. Scottish Enterprise (who own the stepped area and the digital media park to the south) has reached agreement with the City Council to transfer ownership of the stepped area to the Environment Department. At the site visit, we agreed the way forward to have the weeds removed and the area improved in the coming weeks. Yesterday, at Blackness Library, I had the pleasure of chairing the first 2013 meeting of the West End Christmas Fortnight committee. Although it may seem a long way until Christmas, as the West End Christmas Fortnight takes a lot of organising, the committee starts its planning work many months in advance. We had a good discussion about events to be run during West End Christmas Fortnight 2013. After the meeting, Rob Carstairs and I had a site visit to Seabraes. Rob is our excellent pyrotechnician, who has put on an excellent community fireworks display each year at the West End Christmas lights switch on. The issue at Seabraes this year will be that the site from which the fireworks display has been launched each year is now being built on – the new District 10 facilities for creative industries companies is being constructed on the site – see right. 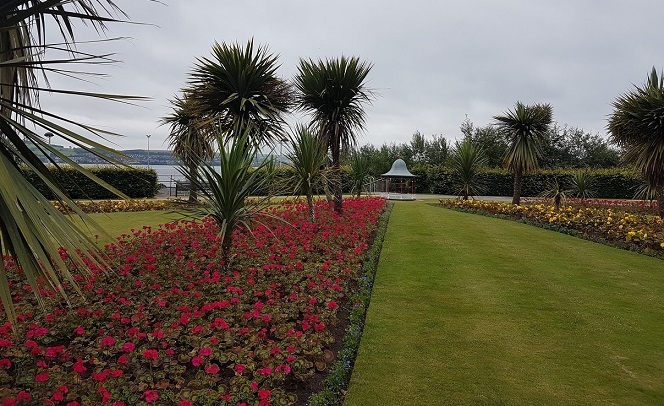 However, having held our site visit, Rob and I are confident that, on a new site, the fireworks display can still take place and we will be discussing this further with site owners Scottish Enterprise and with Dundee City Council in the coming weeks. I was interviewed on Wave 102 News yesterday about the good progress the District 10 Creative Media District is making at Seabraes Yards.